five + 9 = Required Please enter the correct value. The Alibaba stock price today is climbing 0.6%, after new CEO Daniel Zhang announced a new plan to globalize the Chinese e-commerce company. Zhang was named Alibaba's CEO on May 7 when the company reported quarterly earnings. In one of his first strategy meetings with employees yesterday Zhang said Alibaba "must absolutely globalize and it must be a successful effort." "We will organize a global team and adopt global thinking to manage the business, and achieve the goal of 'global buy and global sell,'" Zhang said, according to The Wall Street Journal. Part of the new global strategy appears to be a partnership with Wal-Mart Stores Inc. (NYSE: WMT). Yesterday, Wal-Mart announced shoppers in China will now be able to make store purchases using Alibaba's mobile payment service Alipay Wallet. The new partnership brings together two of the world's top retailers. WMT has a market cap of $252.7 billion, while BABA is valued near $220 billion. 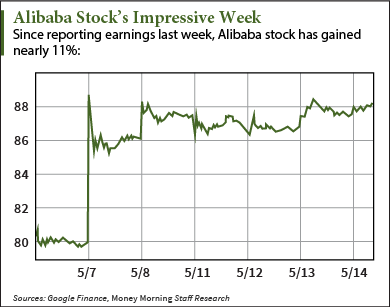 WMT stock was hovering near $78.50, while the Alibaba stock price today hit an intra-day high of $88.23. Zhang also said that Alibaba will ramp up the promotion of its AliExpress platform. AliExpress is a sales platform that helps users sell Chinese goods internationally. Another key will be expanding Tmall, a site that helps connect international sellers with Chinese consumers. Finally, Zhang is dedicated to hiring more international employees. "We will have employees from all over the world that look different from each other," he said. "We have to take the time to understand them to understand their habits, cultural differences, and way of thinking. This is how we become truly an international company." Oddly, that statement came just weeks after Chairman Jack Ma announced a hiring freeze for the rest of 2015. But when the freeze is lifted, it's clear Alibaba will expand its borders. Alibaba's globalization announcement didn't come as a surprise to us at Money Morning. We've been following the company's expansion closely, well before the IPO.